Looking at the possibility of cheap dental implants in Cancun? You might have been told by your dentists at home you don’t have enough bone for dental implants, but the truth is in that case you might be a candidate for bone graft! 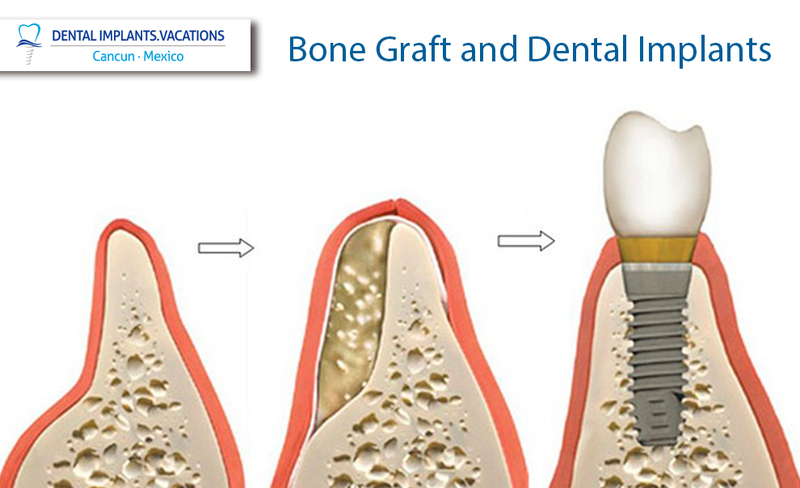 Bone graft is a great option for people who have had too much bone resorption. Bone resorption is a process that happens when the bone starts receding or shrinking. It usually happens when the tooth that was there is missing. The root of the tooth serves to stimulate the bone and prevent the resorption. The older you get the more resorption happens. there are other important factors that can exacerbate bone resorption like osteoporosis, age, gender, gum disease and many more. It is very important for us to check your x-ray photos and/or CT-scan pictures to evaluate if you will be needing bone graft to make dental implants a possibility. How are bone graft made? Once you have been confirmed as a candidate for bone grafts, the procedure to get bone grafts is a relatively fast one. You will be given local anesthesia, although you could also ask for dentistry sedation for an extra fee but sedation itself is another topic. The doctor will open the flaps of your gums and will scrap on the bone area where the graft will be placed. This is to allow the bone to “absorb” and bond itself with the “bone material“. Depending on the particular case the gums might be closed back to let the bone to heal and regrow. If you want to know more about Dental Implants in Cancun call toll free from USA and Canada 1-800-701-6039, or if you are already on vacation in Cancun and want to meet us, you can call us for an appointment at the following local number (998) 1-40-51-25.